The Oberkotter Foundation was created by Paul and Louise Oberkotter. Paul was a long-time employee of United Parcel Service (“UPS”), beginning his career at age 20 as a typist/accountant for the founder, Jim Casey. Paul rose through the ranks, serving as president for 10 years and ultimately as chief executive officer and chairman of the board of UPS. He retired in 1985 after 60 years with the company and remained on the board of directors until 1994. Paul and Louise had a daughter, Mildred, who was deafened in infancy. In choosing a communication option, they decided that Mildie would learn to communicate through spoken language and would be a full participant in the community. Recognizing the importance of having appropriate educational supports to achieve their goal, they ensured that Mildie had a quality education. 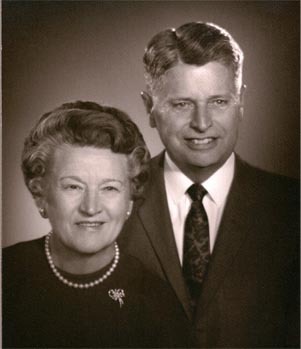 In 1985, Paul and Louise, working with their personal attorney, George H. Nofer, created the Oberkotter Foundation. Paul and Louise provided the funding for the Foundation and served with George as the original Trustees. Mildie became a Trustee upon Louise’s death in 1987. George served as the first Executive Director of the Foundation and helped develop the early focus of the Foundation. The early focus was based on Paul and Louise’s primary interest in diabetes and deafness, but also incorporated other areas of medical research. Bruce A. Rosenfield became the second Executive Director of the Foundation in 2003. In recent years, Mildie’s vision of the future has led the current Trustees to focus funding mostly on deafness-related issues. Our grant guidelines describe our funding areas more fully. In 2016, the Foundation celebrated its 30th year supporting listening and spoken language opportunities for children who are deaf or hard of hearing. In honor of the occasion, the Trustees created a short film celebrating Paul, Louise and Mildie’s journey and the impact that journey has had on the Foundation’s mission and vision. We invite you to watch the Oberkotter Family’s journey to spoken language and we look forward to hearing your family’s story. Congratulations to our Spring 2019 Grantees! Our Fall 2019 grant cycle will open June 1st with LOIs.